I flew from Charlotte the following morning and arrived in St. Maarten in the afternoon just before 2pm. Passengers deplane from both the front and back of the aircraft. Don’t choose row 19 in the plane. This resulted in being last to immigration. Fortunately, I was still in transit, so I entered the empty “resident/transit” line. In the end, it didn’t matter as my checked bag came out on island time. Normally I avoid checking a bag, but I had my dive gear! I picked up my gear and had 10 minutes to make it to the ferry terminal just a short drive away. I was a little anxious about reserving the ferry in advance as the tickets are non-refundable. While they accommodate delayed passengers on the next ferry with space, the ferries depart on an hourly basis (and GB Ferry every 1.5 hours), thus the idea of sitting at the ferry dock for an extended period of time as my vacation to Anguilla began was far from appealing. Not familiar with the plane to ferry to taxi process in getting to Anguilla, prior to leaving Denver, I contacted my hotel, Fountain Anguilla, and asked if there would be taxis available at the dock and the approximate cost. Prudence informed me that taxis will be there, and they cost $28. In addition, she forwarded me two ferry forms. I was to choose one and fill it out. The hotel would make the reservations. Prudence suggested GB Ferry as they provide the guests at Fountain Anguilla a discounted rate. That sounded like a good choice to me, but I didn’t receive the discounted rate and along the way I learned a lot about the taxi and ferry process from St. Martin to Anguilla. Anyone making this transfer should read 15 Things to Know About Anguilla Ferries and Taxis. Prudence kindly upgraded me from a garden studio view to a penthouse oceanside studio. While lugging my 50 pounds of dive gear and clothes up three stories of stairs was a small struggle, the room and view were worth the short strength training interval. The large room included a king size bed, a sitting area, and a floor to ceiling storage armoire. The well decorated room was pleasing to the eye and a view of the ocean from the balcony was a nice perk. A nook next to the bathroom included a microwave, small fridge, utensils and dishes. The bathroom featured two sinks and a two-headed shower. The room also included nice touches like wicker laundry baskets and a lovely fan. A pool was centrally located between the condo buildings and gardens surrounded the entire Fountain Anguilla complex. On the backside of the pool area, a path leads down to the spectacular Zemi and Shoal Bay beaches. I took a 45-minute sunset stroll (round-trip) along the beautiful sandy shore. I first passed the luxurious Zemi Beach House Resort & Spa located right next door to Fountain Anguilla. I felt pretty good about reserving the same beach for $500+ less per night! I could easily eat at Zemi’s restaurant or get a spa treatment if I wanted while staying at the lovely Fountain Anguilla. I continued on my stroll while checking out the other restaurants that lined the beach including Gwen’s Reggae Bar and Grill, Uncle Earnies, Tropical Sunset and a few others. Before I returned to the Fountain Anguilla, I decided on Uncle Ernies for dinner. It was one of the few places ready to serve early diners like me. Most places didn’t open until 7pm. I had my chicken kabob special by 6:30. In addition, the prices at Uncle Earnies were more reasonable than the surrounding restaurants. The following day, I used the lounge chairs in front of Tropical Sunset. The Fountain Anguilla has an agreement with them, and guests of the hotel may use them for free. It’s maybe a 7-minute walk down the beach, so for anyone who doesn’t want to walk that far, the Fountain Anguilla provides camping chairs and umbrellas that may be carried to the beach as well. I didn’t mind the walk and the lounge chairs are in front of a restaurant with a bathroom, so that can’t be beat. I lounged on the beach chairs as I worked on my “Rambo Tan” (I missed a lot of places with the sunscreen) before enjoying an awesome lunch, mahi-mahi with sweet potatoes, salad and plantains, at Tropical Sunset. Along with the taxis, however, many of these restaurants require cash unless the meal is over $25. Conveniently, most the entrees are priced at $24. Since I rarely order a drink, I was shelling out GREENBACKS regularly! The service at Tropical Sunset was outstanding. The owner not asked if everything was to my satisfaction, but also asked if they could change anything to make my experience better. It’s not often I get asked that in a restaurant, especially one on the beach! I tried eating lunch at Gwen’s Reggae Bar and Grillas well as Zemi at 11am on another day, but that was too early. The chef wasn’t even at Gwen’s yet! I attempted an early lunch because I was scheduled for my return ferry to St. Maarten on the south side of the island and the REQUIRED check-in time highlighted in yellow was at 1pm. Needless to say, I was a little peeved that I skipped lunch only to arrive at the counter while the employee was out getting lunch! Anyway, for my first full day on Anguilla, other than lounging on the beach, I tried out some snorkeling. I wouldn’t recommend the snorkeling in front of Tropical Sunset, though it was nice to get a little exercise. I later found out the snorkeling in front of Zemi is better, though I never tried it. Instead, I opted for “the best snorkeling on the island” at Little Bay the following day. Upon the recommendation of a gentleman from Michigan, I looked up the snorkeling at Little Bay. It was a top place to visit according to TripAdvisor. Reviews advise visitors to pay Calvin $15 for a boat ride from Crocus Bay to Little Bay. He waits by his boat from 9 to 5 to offer snorkelers rides to the sheltered beach. Early arrivals would be rewarded with the cove to oneself. As a result of the reviews, I had my hotel call me a taxi. Prudence happily called a taxi for me after office hours. I was only taking a 15-minute ride one zone over, so I figured it would be $8 or so. I found out when Shavern came to pick me up it was $18. Oh well, she was excellent, and it was convenient to Whats App her for future rides at 264-582-8411. Not only does she drive a taxi, she bakes a variety of sweets that she delivers on Fridays. Slices of cakes were packed in plastic containers in the back of the van. Upon arriving at Crocus Bay, I didn’t see Calvin or his boat at first. Shavern helped me look and found him still sitting in his car. I guess he starts at 9am island time which was closer to 9:30. I also overheard him say the last pick up is at 3, not 5 (per the reviews on TripAdvisor). Perhaps it changes based on the day and season. While I waited for Calvin to get his boat, I asked Shavern if she could pick me up at 11:30. Next, I joined Calvin in his little boat as he motored me over to Little Bay. He confirmed he’d be back at 11:15 to retrieve me. Aside a from a catamaran moored out in the bay, I was the only one at the picturesque cove. Per Calvin’s suggestion, I snorkeled around the rock edges. I found a scorpion fish, but beyond that, there wasn’t too much interesting fish life…just the usual sea urchin and goatfish. A vacationer who seldom snorkels and doesn’t SCUBA dive would likely enjoy the usual fish life, but I found it common place. If I wanted to swim in the middle of the bay, according to Calvin I could have spotted a turtle. I likely should have ventured out because I LOVE turtles, but many people began arriving, including tourists on jet ski like watercraft. While the bay is a “safety zone”, being a single snorkeler, I looked out for myself and stayed away from the boat traffic. One rock in the middle of the bay is used for jumping into the water. A fun activity for those who don’t snorkel. A rope helps people climb up 10-feet for their plunge. I was beginning to get cold from snorkeling when a group of 15 began jumping off the rock, so it seemed like a good time to rest on the beach. The beach at the cove was tiny. I relaxed for a bit, but soon eight people crowded onto the 20-foot sandy stretch. Since I prefer a little more solitude, took an early ride back from Calvin as he dropped off another group. We returned to a much larger Crocus Bay Beach with no one on it! This was my kind of place. I soaked in the warm sun rays until Shavern picked me up. I read about some local lunch spots in the Valley. Most of the time, I prefer the local digs over tourist spots, so I asked Shavern if she’d take me to Hungry’s. The owner of the food truck used to be a chef at many of the fancy hotels on Anguilla. We arrived at a building and the restaurant was virtually empty. We were too early for the upbeat lunch crowd that I wanted to see. I asked Shavern about the food truck, and she informed me it was destroyed in the hurricane a year ago. Apparently, the Anguilla marketing material was slightly outdated. Around the corner from Hungry’s, however, was “the strip” as the locals call it, with many outdoor restaurants. I had also read about Ken’s Pork BBQ and Shavern agreed it was tasty. We arrived at 11:45, just before the crowd. As such, I returned to the open-air counter and grill and ordered the same thing plus fries. I think the total was $9 (I had to pull teeth to find that out too). But I ended up with two full meals for half the price of a tourist destination! Shavern was nice enough to make this lunch stop without charging me. Originally, I planned on eating on the patio with the locals, but with Shavern waiting on me in the cab and the staff somewhat unpleasant, I took that as a sign to go back to the hotel. Of course, that was another $18. For the taxi, tip, two ten-minute boat rides, and two lunches, my 45-minute snorkeling excursion cost $64. I could have gone diving for that price! While it is always nice to explore and meet the locals, I can’t say that snorkeling at Little Bay was worth the money. I suspect my opinion might be different had I rented a car (a big mistake I made by trusting a TripAdvisor review). 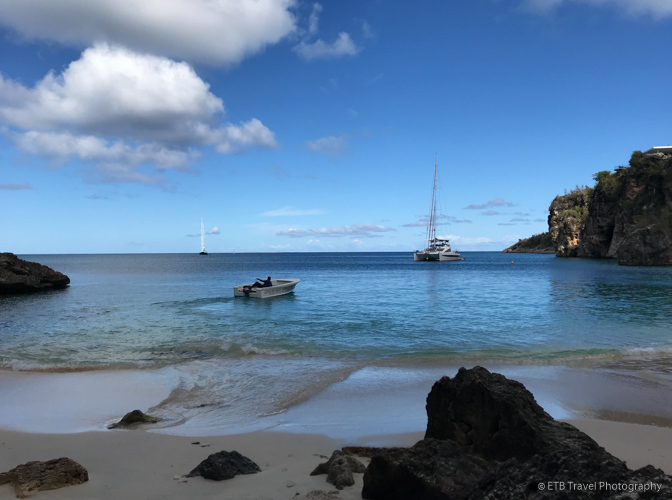 I suppose I could have gotten the snorkeling excursion down to $49 by cutting out the boat ride, but this requires scaling down rocky cliff at Little Bay while carrying any gear with only a very thin nylon rope for support. No thank you!